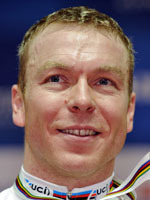 The thundering thighs of Chris Hoy have powered the Scotsman to the unique feat of being the first track cyclist to have held world titles in all four sprint events while his twenty world or Olympic medals make him a global colossus. He is a key part of an ultra-competitive British cycling team that took nine titles at the 2008 world championships in Manchester with individual titles in the sprint (seen as the top track event) and keirin and silver in the team sprint gold. The team also includes Tour de France men Bradley Wiggins and Mark Cavendish, as well as world champion cyclist Rebecca Romero who make the successful switch from rowing to cycling not to mention the equally fancied Victoria Pendleton. Hoy is aiming for a personal tally of three titles at the Beijing Games and if the 32-year-old from Edinburgh can maintain his Manchester form, he is certain to be close to the winning pace. Hoy began competitive cycling at just seven-years-old and was once Scottish champion. He was also a British junior rowing silver medallist in the coxless pairs and a handy rugby union schools player. By the time he turned 18, he was a member of the renowned Edinburgh track club and a member of Britain's national squad two years later in 1996. Since then there has been a veritable flood of medals, the first a silver in the 1999 world team pursuit, followed by an Olympic silver at Sydney 2000 in the same event. He went to the Athens Games in 2004 as world kilometre champion and added the Olympic crown in a world record time. Unfortunately the kilometre is no longer an Olympic event, forcing Hoy to move over to keirin in 2007, where he immediately won a world gold, and sprint in 2008 where he surpassed his expectations of a top-four finish by snatching the world title. The sprint was a tough learning curve and in his quarter-final against Theo Bos he lost the first leg after losing sight of the Dutchman, but says his German coach Jan van Eijden, who won his own world sprint crown in 2000, is helping matters. "I now have tactical awareness to go with my speed. I made a couple of mistakes in earlier rounds, but the confidence I get from having the best coaches - guys who have been there and done it before - is amazing." Tactics are also a factor in the keirin where he prefers to ride out front in the physically tough discipline to avoid the shouldering and neutralise attacks. France will again be favourites to take the team sprint at Beijing and the Netherlands will also be a threat, but Hoy's sheer grit and determination may give Britain the edge.